Same Team. Additional Resources. Renewed Commitment. Our online payroll solution combines a powerful and intuitive web-based human resource and payroll software application with the convenience of services typically offered by payroll outsourcing providers. If you’ve outgrown your current payroll service, or if you’re seeking an extremely flexible and robust online payroll solution, we should talk. Darin joined the Southwestern team in 2001 as a Systems Analyst and Developer before acquiring the role of President in 2012. Darin is a hands on leader who understands the ins and outs of all aspects of the payroll industry. Darin has extensive leadership experience and is an out of the box thinker who loves to roll up his sleeves and tackle any obstacle that presents itself. Darin serves as Board President for the Reed Community Foundation, a local organization that works to support at risk teens and young adults by providing resources and guidance designed to help them stay in school, out of trouble and reach their goals. In addition, Darin is the Past President of the Holland Hall Alumni Association and a former member of the Board of Trustees. Darin has a BS degree in Computer Science from Oklahoma State University. Marisa has over 23 years of experience in the payroll industry - including client implementation, payroll support, tax filings and payments, notice resolution and payroll & tax compliance. Prior to joining CloudPayroll, Marisa was responsible for all payroll tax and compliance operations for a national payroll provider with over 27,000 employer clients. Marisa enjoys implementing structure and process improvement initiatives throughout the organization. She understands the importance of timely and accurate tax reporting while at the same time providing a high level of customer service to internal and external clients. She has a Bachelor of Science degree in Business Management and has also earned and maintained a CPP designation since 2007. Frank joined the Cloud Payroll team in May of 2015 after a successful stint in Sales Consulting achieving record growth at an Inc 500 payroll service bureau. Prior to his time in the payroll industry Frank founded and ran a chain of AT&T stores that were acquired after record sales and retention results were achieved with the proprietary “Loved Customer System” process that he developed. Frank was the former Chapter President of the Albany, NY EO (Entrepreneurs Organization) and has done extensive speaking and consulting with sales teams and leadership teams in multiple industries. Frank has his FPC certification through the APA (American Payroll Association) and is active with the many partnerships that Cloud Payroll has within the ASA (American Staffing Association) and IFA (International Franchise Association). Patrice provides a strategic client-centric approach in deploying the suite of CloudHCM services within the CloudPayroll ecosystem. With PHR and SHRM-CP professional certifications, Patrice has served as a true Business Partner to senior leadership including CEO, CFO, COO, VP Sales, and Business Segment Directors to optimize employee talent across several industries and departments including leadership, IT, finance, sales, legal, and operations. Patrice has a BS in Marketing, MBA in International Business, and remains a doctoral candidate (ABD status) for a DBA in Leadership. She has been a full-time and core member of the team since 1997. Currently, Rachel oversees the day to day operations of our business including Payroll Specialists, Tax, Shipping, and Processing. In addition to her primary duties, Rachels’ experience and broad knowledge of Payroll Operations makes her a go to person within our team for any number of projects and problem solving. Her most recent title is Special Projects Manager, a title that tries but does not quite cover all of the hats that Amy wears. She is a go to person and a trainer for Sales, Implementation, and all manners of processing. In addition to her work here, Amy is also on the board of the Joshua UpChurch Memorial Band Scholarship Program. Becky is a fantastic resource for HR and Benefit information. In her current role she handles all ACA and Benefit administration for our clients as well as the SPSI employees. In addition, she manages customer support for our Human Resource clients, handles compliance reporting, in house payroll processing, quarterly payroll reporting and custom report writing. Becky holds a CPP certification with the American Payroll Association. One of John’s most important roles is training clients in the use of TLM products. John is an excellent problem solver and high level communicator dedicated to providing the best level of service possible. Lynette is proficient in multiple payroll platforms in order to assist our clients. Lynette is passionate about ensuring our clients have the best possible experience. Lynette holds a Fundamental Payroll Certification from the American Payroll Association. Most recently, she serves as the liaison between the Business Development and Implementations team. In addition, she is our in-house Marketing Specialist designing creative and compelling marketing materials. Jim has 46 years of business experience in the Tulsa metro area. For the past 28 years he has been in outsourced payroll processing. Jim is a 1970 graduate of the University of Tulsa with a BSBA in Accounting. Jim is a long-time member of IMA-Institute of Management Accountants. He is a Past President of the Tulsa chapter, Past Regional Council President, and Past National Vice President. Stevi brings with her over 20 years’ experience in business with an emphasis in payroll, sales and accounting. Although her “job” is payroll, she understands the gravity of what she does for a living. Providing excellent payroll service can free up business owners to do what's most important, grow their business. Stevi is driven by the opportunity to help individuals who are running businesses streamline and simplify their payroll process. Stevi acquired an Associate of Science in Business Accounting from Tulsa Community College and is on track to receive her Bachelor of Science from NSU BA. Austin is passionate about helping businesses meet their payroll needs. Austin has a Bachelor of Science in Business Administration from Missouri Southern State University. At Southwestern Payroll, we’re proud that our association with CloudPayroll helps us provide customers with innovative tools, hands-on service and fresh thinking. CloudPayroll is a new approach to payroll and HR support. The company is dedicated to supporting independent service providers, such as Southwestern Payroll, with advanced software and access to centralized payroll resources and expertise. By rethinking what payroll and HR can and should be, CloudPayroll is simplifying the process, enabling all types of companies to concentrate on their core business. Southwestern Payroll is ideally suited to offer our customers easy-to-use, intuitive online tools combined with localized, personalized service. How is Southwestern Payroll different than a typical payroll service? Like a typical payroll service, Southwestern Payroll smooths the bumps in the road (and in some cases, removes the hazards), but rather than take over the wheel, Southwestern Payroll puts you in the driver’s seat. Specifically, Southwestern Payroll is a combination of software and services, available for one flat-fee. It’s a native, internet payroll solution designed to provide you full on-demand access to all payroll and HR functions within one system, without the added headaches of making tax deposits and filing quarterly and annual reports. Southwestern Payroll also provides an HR Support Center, which includes live answers to your HR questions, a comprehensive library of HR forms and common job descriptions, educational articles and newsletters, and many other HR resources at your fingertips. With key statistical HR and payroll data (HR Dashboard), a custom report writer with access to real-time data, and an employee self-service portal, all available 24×7 within a single secure system, Southwestern Payroll is much, much more than a typical payroll service. Can I offer my employees direct deposit of their paychecks? Yes, direct deposit is included in our service at no extra charge. Employees can deposit into an unlimited number of accounts. What hardware or software do I need? No special software, nothing to load. All you need is a broadband connection to the Internet and a web browser. Will Southwestern Payroll interface with my accounting system? Southwestern Payroll interfaces with most popular accounting systems. After you set up your chart of accounts, you simply download a file to import into your accounting program. It’s much easier than you might think. How do I know my taxes are being paid? We guarantee that your taxes will be calculated and deposited correctly and on time. Your tax deposits are all fully bonded and insured. What reports do you have and how do I get them? Southwestern Payroll provides many standard pre-built reports available at any time for any current or past payroll. We also provide a custom report writer for your ad hoc reporting needs. Do employees have access to their data? At your discretion, you can set up your employees to log into the employee self-service portal of Southwestern Payroll. They can view past paychecks, update contact information and review paid time off balances. This service is provided at no extra charge for you or your employees. We need your authorization to pay taxes on your behalf, collect funds to pay for our service and the balance information on your employees. To receive our electronic startup packet, contact us. Can I track employee events such as review dates and expiration dates? Yes, you can customize your Southwestern Payroll Dashboard to display upcoming events such as annual review dates, motor vehicle report due dates or employee birthdays. You can also generate date-sensitive reports for any employee events. What’s the HR part of Southwestern Payroll all about? 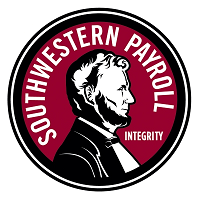 Southwestern Payroll is more than just a traditional payroll service or software. It is an on-demand HR system that generates your payroll and tracks employee events, turnover, review dates, company property and employee training. Additionally, you have access to HR answers and resources in the HR Support Center. Can I allocate employees’ pay to different departments? Yes, you can allocate employee pay to different departments, work sites, divisions and even project numbers. When are reports available to me? With Southwestern Payroll, reports are available immediately which is when you want them. As soon as you key in payroll time, you can review any payroll report, so you can verify the data is correct before printing the checks. Can I track my employees’ vacation, sick and other paid time off? Yes, you can set up each employee to accrue time per pay period, month or year. You can also set up time that will roll over to subsequent years. Southwestern Payroll is on a mission: to simplify payroll and HR for all types and sizes of companies.